Kelly this is awesome! This should be in a book or magazine. The amount of effort and detail is stunning. A+ for you my dear. 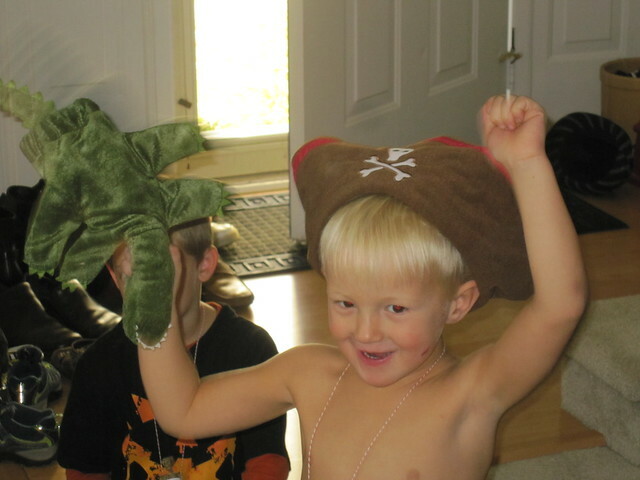 Wish my pirate was a little boy again and not 17, he may not appreciate it as much now as he would have then. I am amazed at the detail and work you put in to make a fun party. 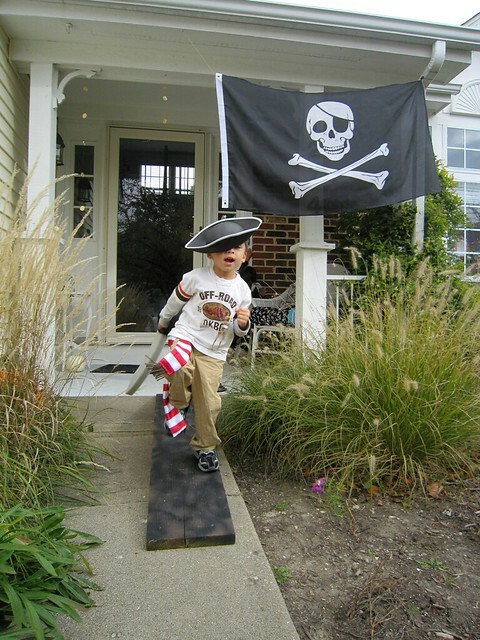 We have a pirates week end in our area so will copy the boat and and some decorations if you don't mind. Oh my goodness! It is awesome!!!! I'm sure there were many great memories made too!!!!! Arrr...I LOVE, LOVE, LOVE THIS, Matey!!!!! What a fun party! My son would LOVE it! Thanks for sharing! WOW, you did a wonderful job on EVERYTHING, it looks awesome!!! You have a lot of energy, it must have been a lot of FUN!! What a positively awesome party!! So much thought and creativity went into it and you can tell it was a huge success. :-) Thanks so much for sharing it with us last weekend at Inspiration Friday! Fun ideas! 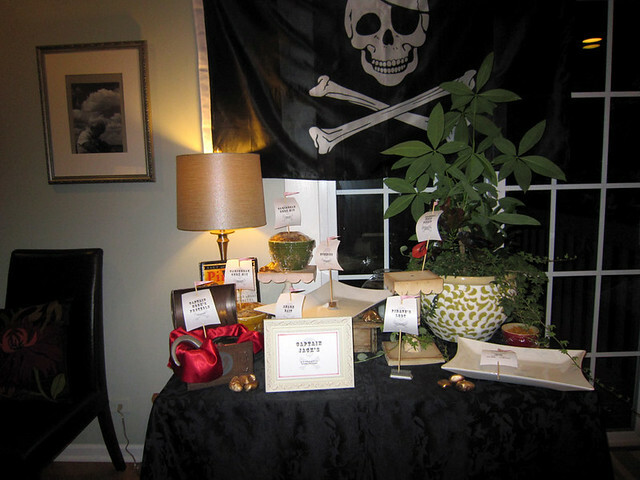 I am throwing my own pirate party! Thanks for the ideas! That looks awesome! Great job! I would love for you to share it (and any other creations) at my new linky party- "Pin It and Win It Wednesday" @ www.cheapcraftymama.com! What a great party! I love those invitations and you came up with some great games! This is such a fun party!! I love all the goodies the kids got to take home...I love seeing what people do for favors. 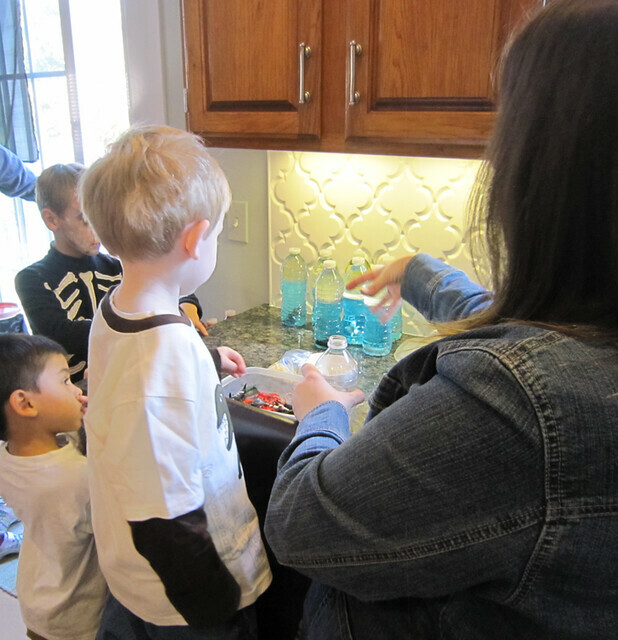 That ocean in a bottle activity is super awesome though!! Love it! 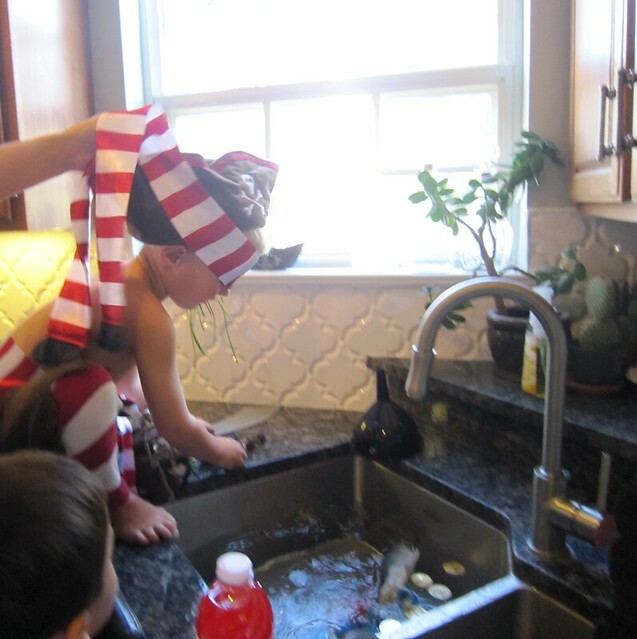 What a great job with lots of creative, low-cost ideas! I adore the cake with the cannon candles. excellent! 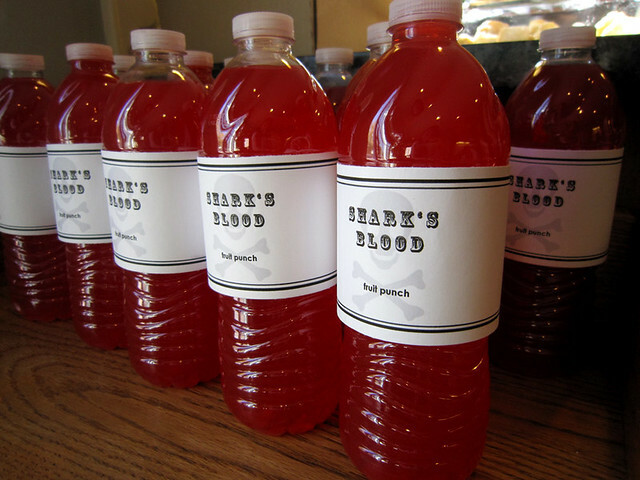 i love how detailed you were right down to the labels on the juice bottles and naming the food. great job! This must have been an awesome party! So many great ideas, and so cute too! I'm definitely showing this to my sister-in-law for my nephew in the future. Thanks for the inspiration! my son is 4 too! 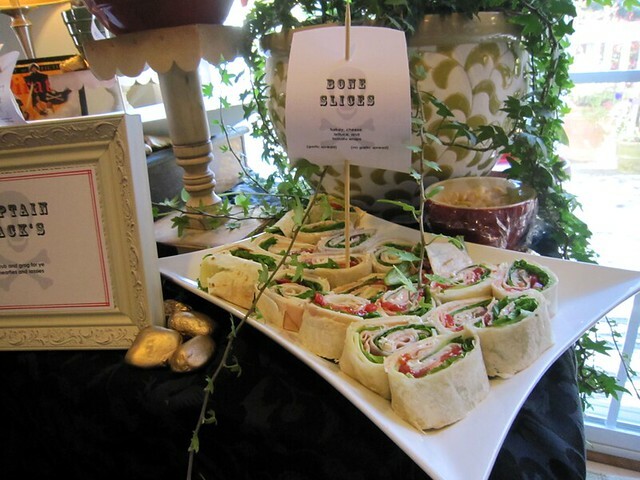 I'm going to pin this... great party ideas! Great party! Love all the details and love you put into it! The flags/ships are great and the best (little) detail is the candles on the side of the cake! So cute! You have some great ideas! I've been wanting to do a pirate-themed party for my little one who will turn 1 in August. I can't wait to use some of these ideas! Thanks! wow, I really like your idea of pirate party.. its really interesting..
Sure! Wasn't sure how to contact you, but maybe you will be checking back here. 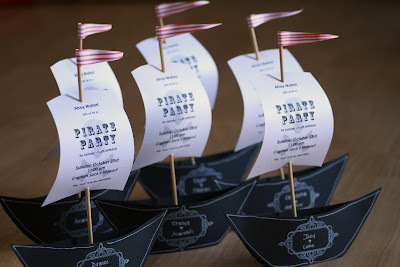 For the sail, print all your party info on an 8.5 x 11 piece of heavy white card stock (walmart sells 150 sheets for $5). There should be 4 sets of party info on the paper. Cut the paper into fours (each section will have one set of party info, and be 4.25" x 5.5"). This is your sail. I freehand cut from here. Doesn't have to be perfect. Rounded the top and mimicked that for the bottom. Then tapered the sides so the top is narrower than the bottom. Punch a hole in the middle top and middle bottom. Stick a bamboo skewer through these holes. Cut a long triangle shape for the flag on top. I didn't have red and white stripe paper, so I took a plain, white sheet and used my ruler and a red marker to make stripes. Sounds more involved than it really was. You only have to do a small portion of the paper since the triangles are so small. Then wrap the fat end of the triangle around the skewer, glue it, and curl the paper a little so it looks like it's waving in the breeze. For the ship part, I just freehand cut a shape for a template(check out the photo for something similar). Then traced around it on black card stock (walmart sells a pack) and cut two out for each ship. I had white ink, so I stamped the frame image in white, and then wrote each kid's name with a white gel pen. If you don't have white ink or a pen, you could stamp something similar on white paper, cut it out, and adhere it to the ship. For the middle I cut a strip of paper about 1.5" and bent it to look like a "w" shape from the side. adhere each side of the "w" to each side of the black ship on the inside. This keeps the ship sticking out in the middle, yet the folds will let it squeeze flat if you need to mail it. Then put a marshmallow on top of the "w" folded paper, and stick your skewer into it. Done! Let me know if you have any more questions. Some parts are a little hard to describe without photos. Thank you so much! His birthday is this Sunday (Mother's Day this year, YAY! ), but due to unforseen circumstances we've pushed his party back a couple weeks. I need to get started on these and other decor as soon as possible. I don't think I've ever done so many things myself, it's so fun and yet so I'm-gonna-pull-my-hair-out. LOL I will make sure to tell you how they turn out. Thanks again!! Wowee, wow, wow! You really went all out!!! 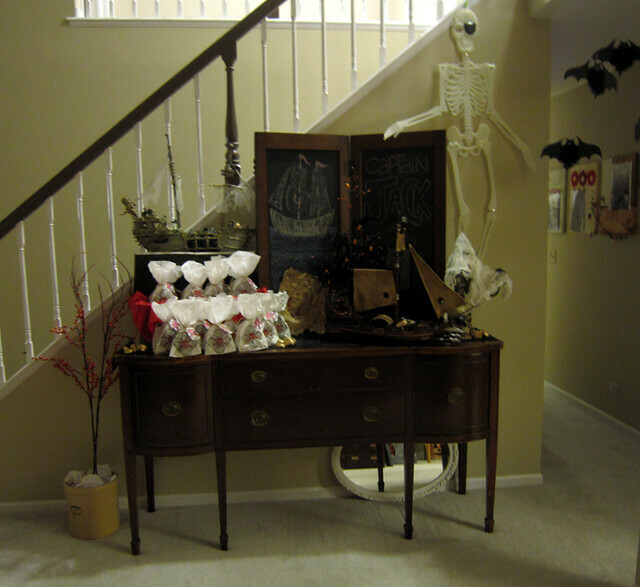 As soon as you commented on my blog something about a "pirate party" I had to come see... and it is AMAZING! I love the invites, and all of the activities - great party! 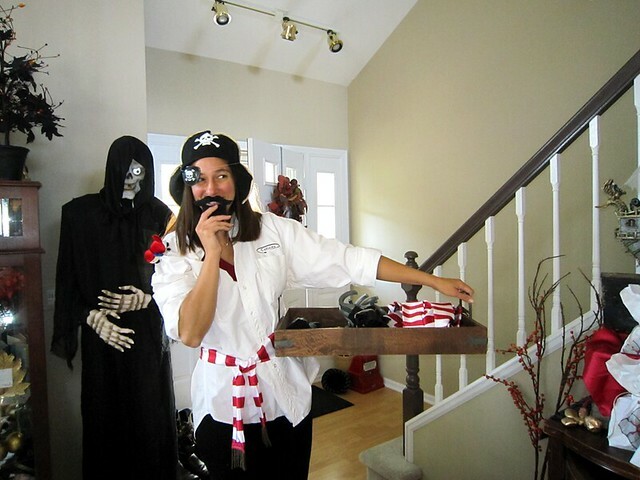 Love, love, love all your awesome ideas and I am using quite a few of them for my son's pirate party next month. Question about the invites: did you have any trouble mailing them with the skewers? Did it cost any extra postage? Thanks in advance! I believe I did have to cut the skewer a little to fit, even in the over-sized envelope I had on hand. It did require extra postage (double?!?) Luckily, I only needed to mail one since I saw everyone else in person before the party date. Would love to hear how everything turns out for you. Good luck with your pirate party!! This is incredible!! 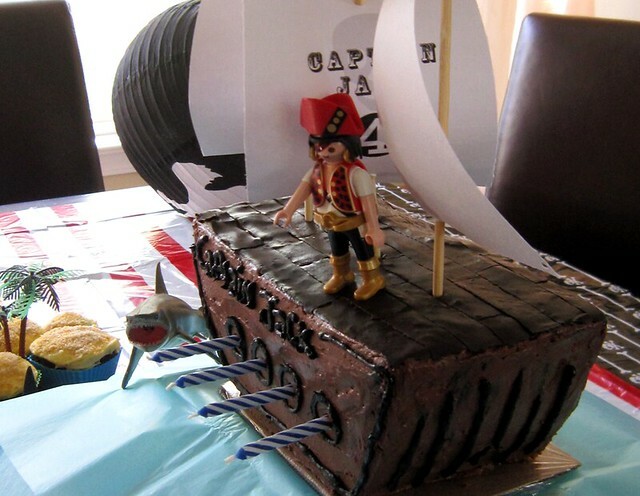 I'm so glad I found this - I am having a Pirate birthday party for my 4 year old on Sunday!! Most is planned but you have given me some great add on ideas! thanks for posting! I'm wondering what you used to make the signs? Welcome sign and the one hanging on the door? Hi Alicia - fantastic, so glad the timing worked out in time for your party! The signs are just beige paper that I cut a ragged edge on, and adhered it to cardboard to give it some strength. Edges are outlined in marker. Jute is knotted and slipped through a hole to hang it from my wreath hanger stand. Good luck with your party on Sunday!! It's a fun theme to work with! 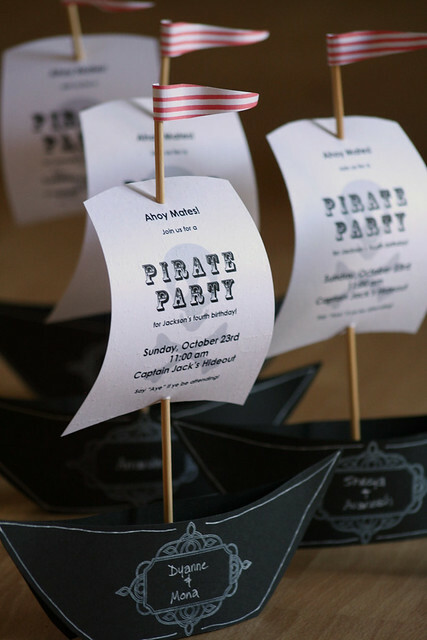 I am planning a pirate party and have searched everywhere for a Cricut cartridge with related images. 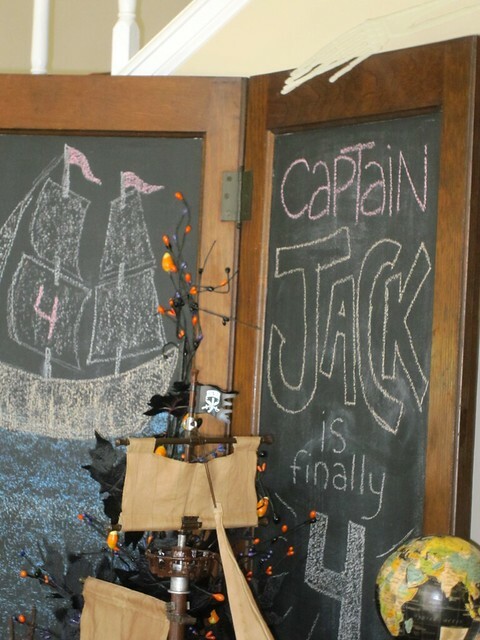 Please tell me the name of the cartridge you used for the pirate ship on the garland. Sure, the pirate ship is from Cricut's Wrap It Up cartridge. It's a great image, tons of details. Not sure if you've seen it, but there's a web site that has indexed all the Cricut images - http://www.mycutsearch.com/. You can type in "pirate ship" and it shows you all the images, sorted by cartridge name. Good luck with your party preparations! Hey. 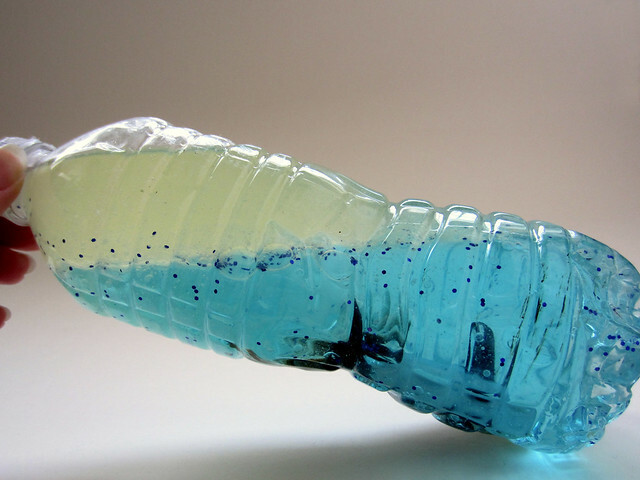 the ocean in the bottle craft sounds amazing. 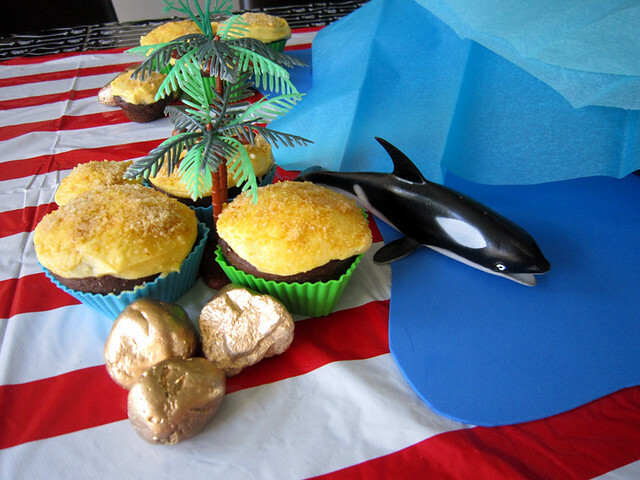 Great themed party and yes, what an effort on your part! 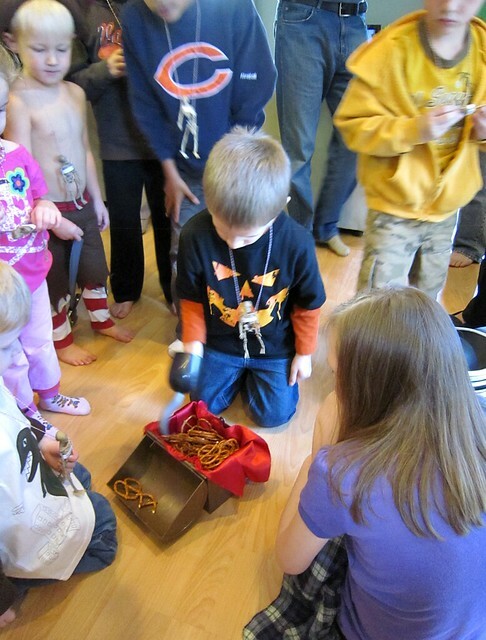 We do kids snake parties and our job is to bring the reptiles and educate the children. But what is amazing is the effort some of the parents to do add to the birthday child's theme for the day. We see wicked snake cakes, reptile curtains and more. Hey, the ocean in a bottle idea is very impressive. Also, the shark's blood sounds terrible. Nice planning. Thanks for the cute ideas and wonderful pictures. 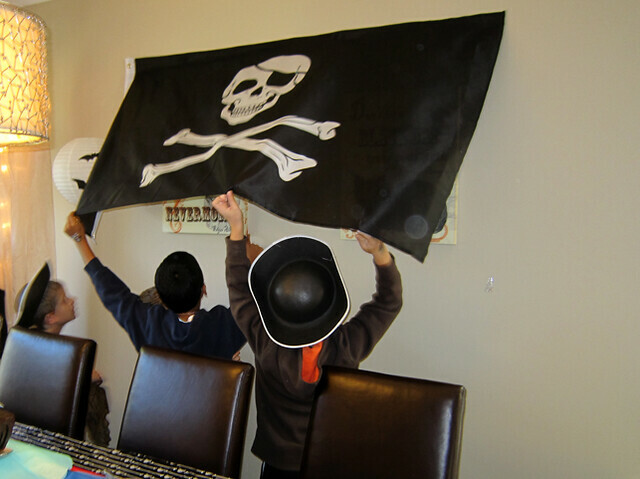 My son wants a pirate party. I can't wait to put your creative genus to use for my own son. Thanks again! Best pirate party I'v seen! You have some killer ideas. I can't wait to incorporate some for my son's birthday this month. Awesome party! 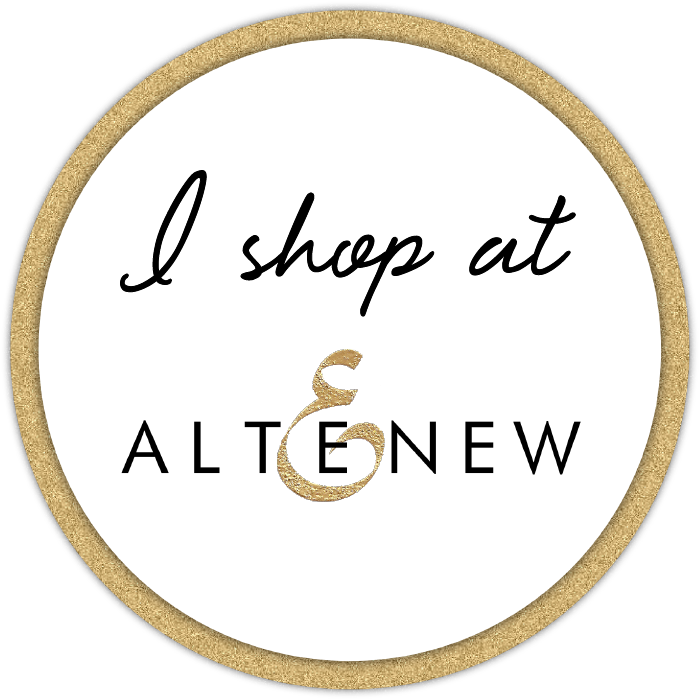 Featuring this on my blog today & following you now too! I love all the ideas! 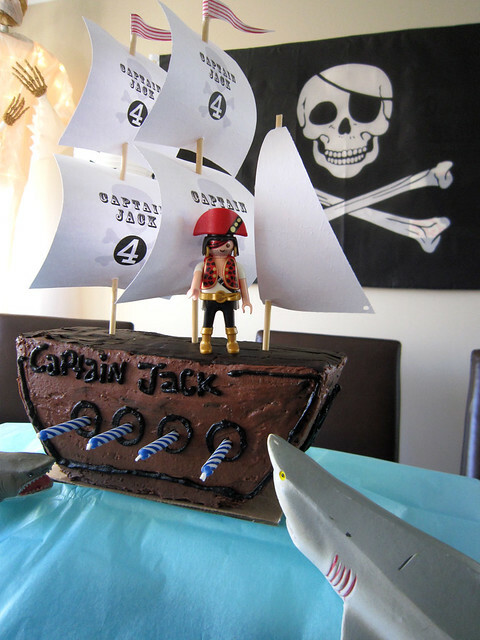 My son is also turning 4 and wants a pirate party! 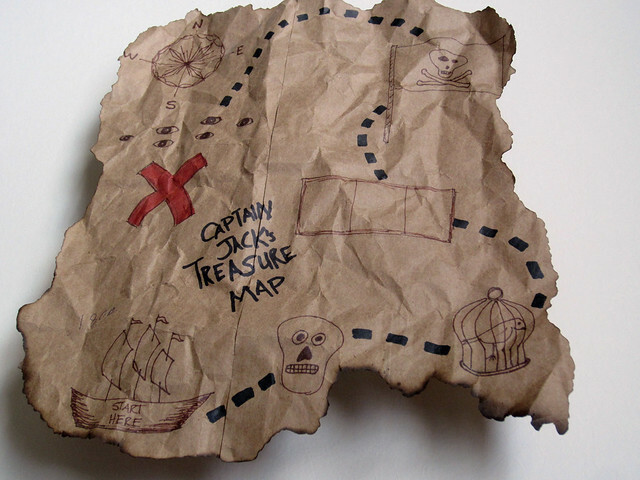 We are going to do the treasure hunt, but each prize will come with a game.I have potentially 24 kids coming from a variety of ages: 1 to 13. I plan to divide them into 3 groups so they are playing different games. Afterwards, they will have cake and ice cream. The younger kids won't get as many games, and will win two prizes per game, so they can get home for naps or rest or something. I couldn't find hats for less than a dollar a piece. Where did you get yours? That was a LOT of prizes for $3/kid, and I would take all the advice you can give! I've already spent close to $100 on this party. P.S. This was SO helpful! I sat down and (basically) planned out the entire party in a matter of minutes! That made things so easy! Thanks again! First of all, thanks so much for your comment, it really made my day! So happy you were able to make some progress on your party. You will certainly have your hands full with 24 kids, but I'm sure your son will absolutely love it all. 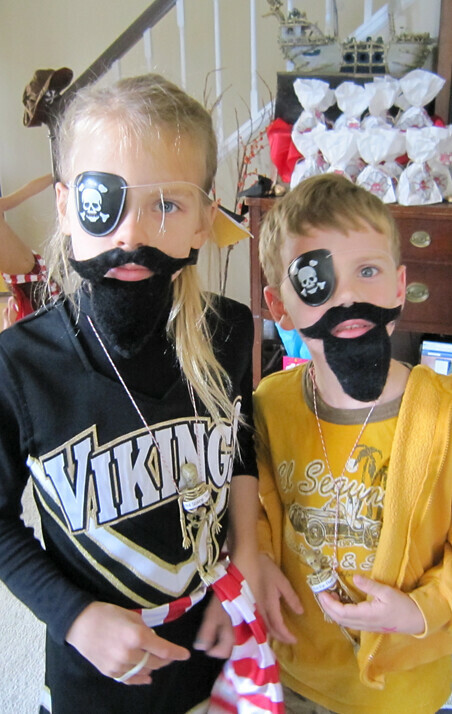 On the prizes, I happened to get lucky at the dollar store, as they had an incredible pirate set at Halloween time that included the hat, hook and eye patch for $1. So lucky. Another dollar was for the foam swords at the Target dollar spot. 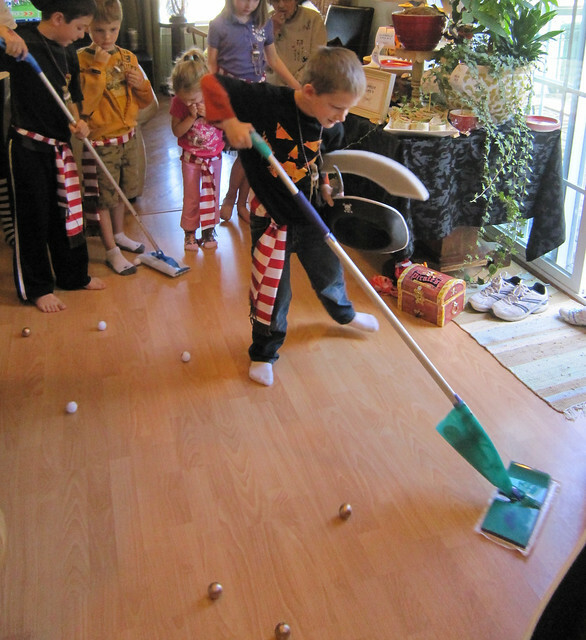 The rest of the prizes were minimal because they were spread over the group. 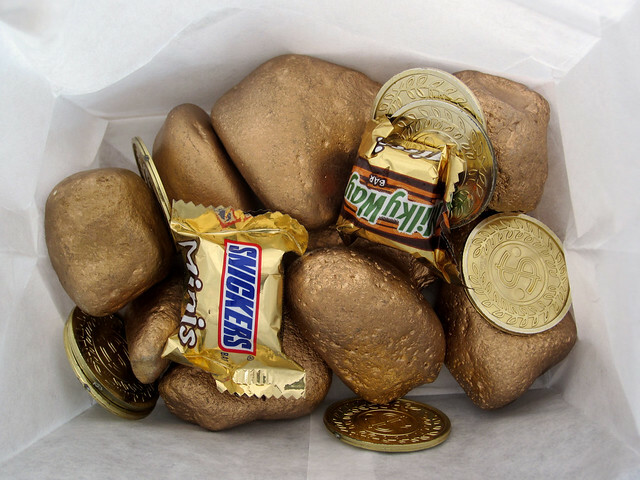 For example, the favor bag with the gold rocks only cost $3 for the spray paint and I think $2 for the rocks, so over 30 kids it's only a few cents. The ocean in a bottle craft only cost $2 for the oil. The mustaches and beards were cut out of a $2 piece of fur, etc. Good luck on your party. I would love to hear how it turned out! 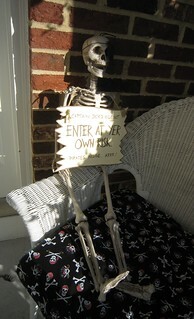 I know I am little late to the Pirate party....can I come next year!!? LOL. This is absolutely amazing! All we need is Johnny Depp/Jack Sparrow now! 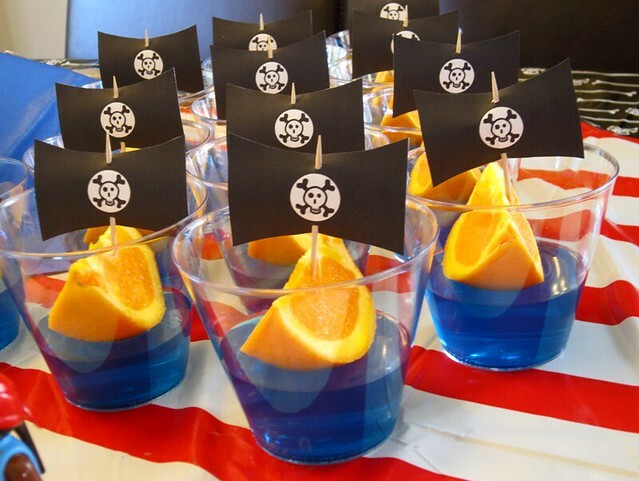 Wow, what a great idea to use the blue Jello around the pirate ship cake! And the plastic animals ... would love to see what you come up with! Thanks so much for the note, and good luck with your son's 3rd birthday party! First of all, congratulations! The party was amazing! I will copy some of your ideas for my son 4th aniversary, here in Colombia. Could you please let me know how you glued ( what kind of glue) the two parts of the ship hull? I tried but the sides do not stick toghether after I put the marshmallow inside. 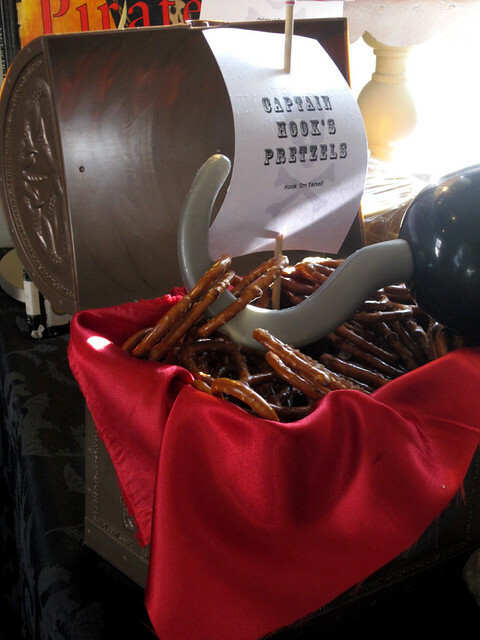 Oh I'm so happy to hear that you tried the pirate ship invitations! For the ship's hull I just used a standard paper glue at either end, let that dry, and then put the marshmallow in the middle. I'm wondering if maybe the hull is not long enough, so the marshmallow is really stretching it? I believe mine was 8" long and that was enough. Let me know if it's still not working. Have a great time with your son's 4th aniversary! Unfortunately, no, I no longer have those documents on this computer. 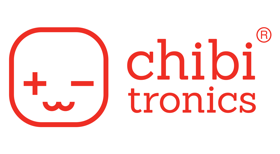 I found the font on one of the free sites so you should be able to get something similar pretty easily. Good luck! 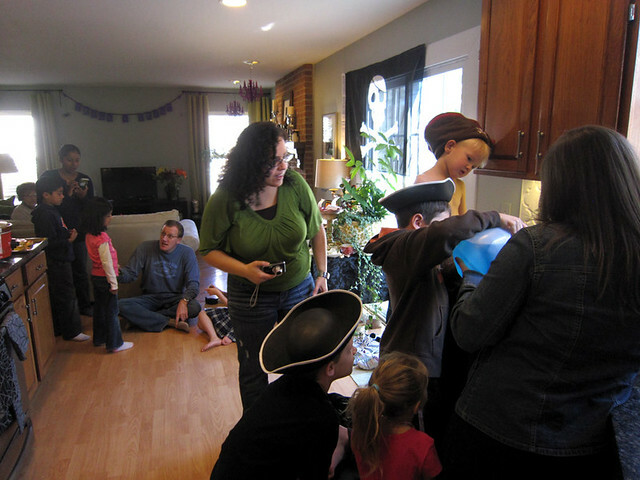 Pirate theme is favorite theme of kids. 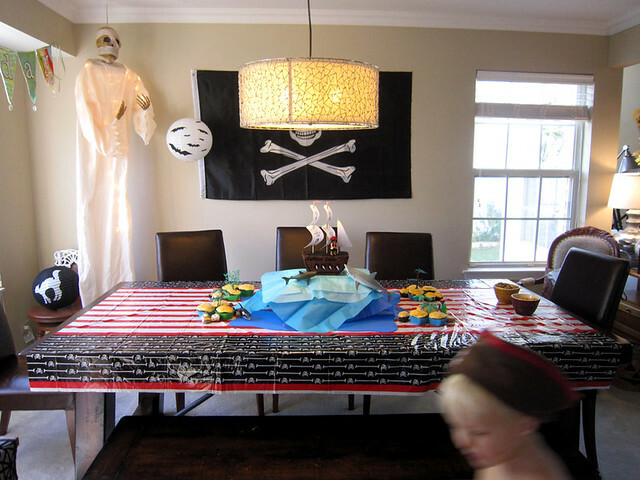 you have posted nice pics.It seems that kids had awesome party.all decorations are nicely done..and those two little pirates with eye patches are super cute. The invites are amazing!!! Would love to borrow the idea. Sorry for detailed questions but do you remember how long the skewers were you used - they look maybe 8 inches? Also any idea how wide and tall the boats were? 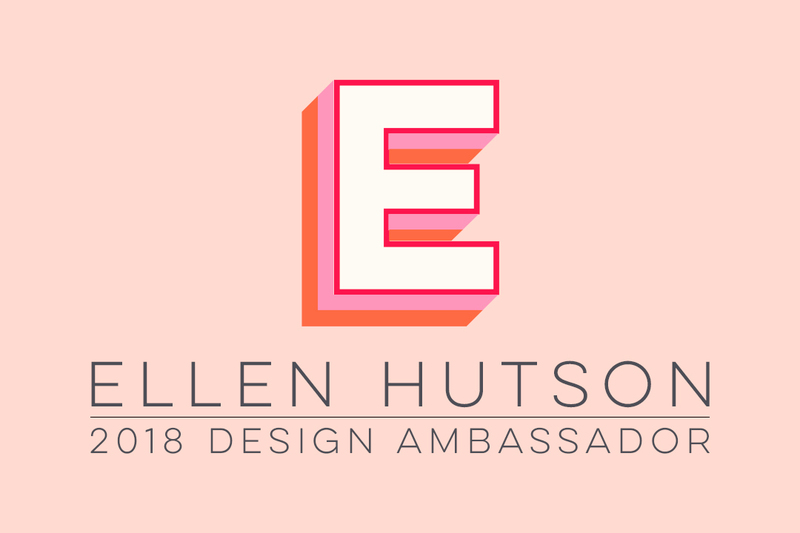 I hope I'm able to replicate the "W" for the bottom you mentioned above - I think I get it....thanks so much in advance!! The sail is 5.5" long, and the skewer looks to be about twice the length. I'm fairly sure the boat was 8.5" long, because I would have used the entire width of the cardstock (hate wasting paper!) I'm guessing the boat is about 3" high. Thank you - you are so kind to reply so soon! I just love everything you did. 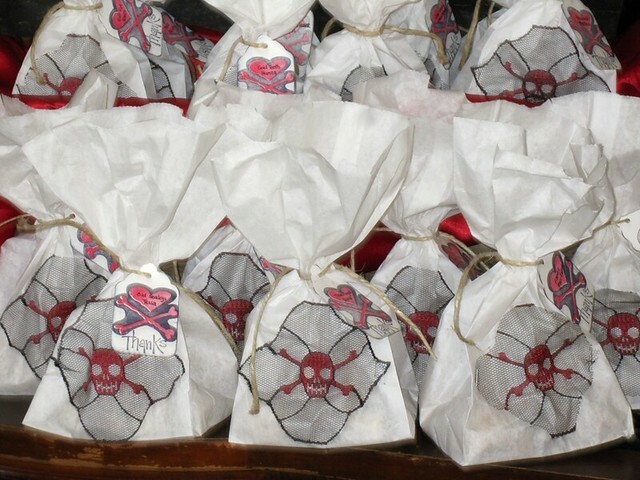 How did you make the skull crossbones out of material for the treat bags? They are so cute, but I can't imagine cutting them out with the detail that they have and they look pretty small. My 4 year old turning 5's party is on Friday. Thank you. The skeletons were super-easy to cut out. It's just netting so it doesn't fray at all. If you look closely at the picture you can see the two on the left I cut carefully outside the black line, but the one on the right was a left-over piece that I just cut where ever and it still turned out fine. Good luck with your 5th birthday on Friday ... have a great time!! Sorry, I'm still a little confused. The red skeleton isn't part of the black netting, right? Do I need red fabric as well as netting? Thank you SO much. Oh, I think I get it. I buy the netting with the skull and crossbones already on it. Ok, I will head over to Joanns. Hopefully they still have it. Right, it's all part of the same fabric. This might have been purchased as a seasonal item around Halloween. Hopefully you can find something similar! Wow Kelly, this is unreal!!! What a wonderful party! Hello! Your party is amazing! I try to make your invitations and according to the specifications in your replies to achieve them in power point. I would like to share with you. How I can upload the image? Fantastic, I would love to see them! Why don't you save the file to Dropbox (from Dropbox.com if you don't have it loaded already) and then send the file address? Here shared the invitation. I only created in power point, printed, cut and paste. Oh goodness! LOVE LOVE this idea! Thank you so much for sharing! How creative and FUN! How did you get your cake to stand up nd not fall apart? I tried and it was more of a shipwreck! Oh rats, so sorry to hear that! I wonder if mine stayed together because I froze the cake first. Since I was making it so far ahead of time, I had to freeze it, but lately I've been freezing every cake before frosting it. Then when it's time to frost, you don't have any crumbs getting in your frosting, or worse, chunks of cake coming off. After it's frosted I stick the cake back in the freezer, and, very important, put it on my list to take out of the freezer the night before. Good luck with your son's party this weekend!! We are doing my sons 2nd birthday party next weekend! Your ideas are awesome! 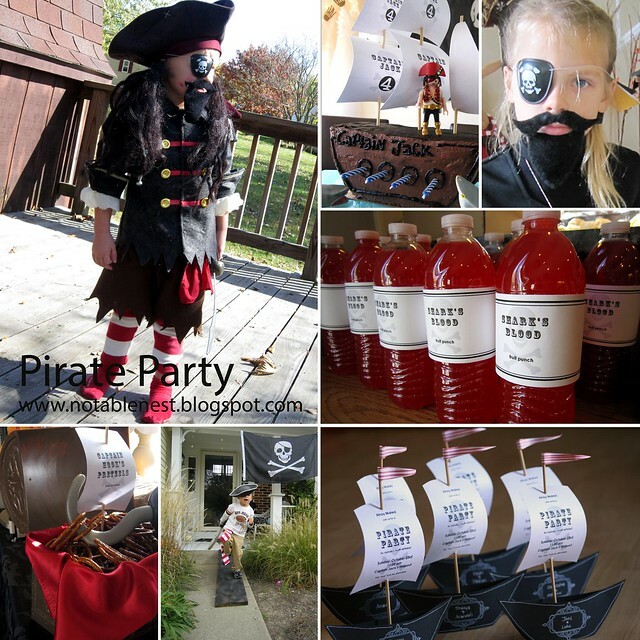 I came across your blog through Google while searching for ideas for Pirate party invitations. I love the little ship so much that I've copied the designed. I changed the text a bit and gave you credit for the idea on my blog (www.stitchingnbits.blogspot.ie) I know this is an old post, but still, THANK YOU so much for the idea! Hey amazing pics! Thanks for sharing it. 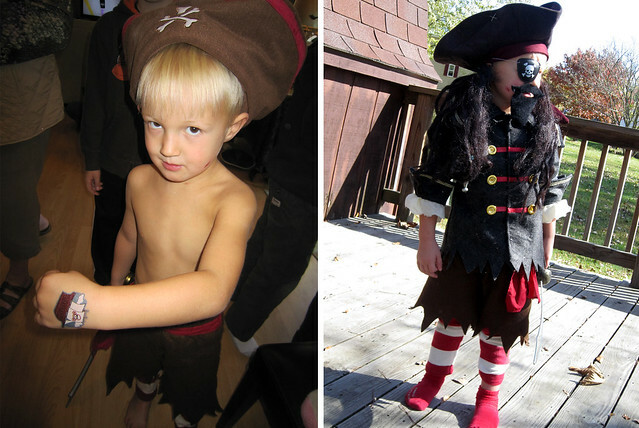 Pirate theme must be quite a preference among boys. That's a pretty curious theme. I dont think kids should be indulging that. The pirate theme and the attire is incredible. Specially the cake is really lovely.